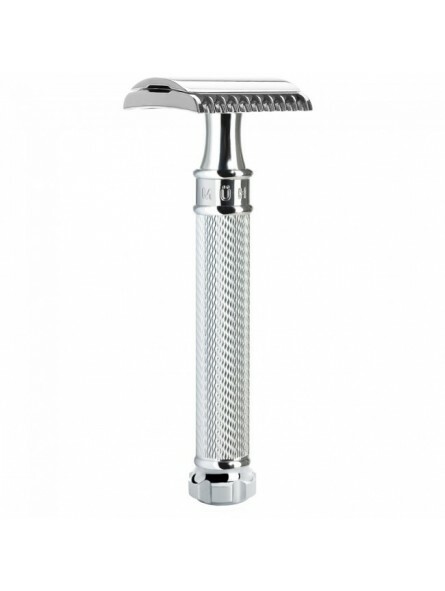 Mühle Double Edge Safety Razor R41 Twist. 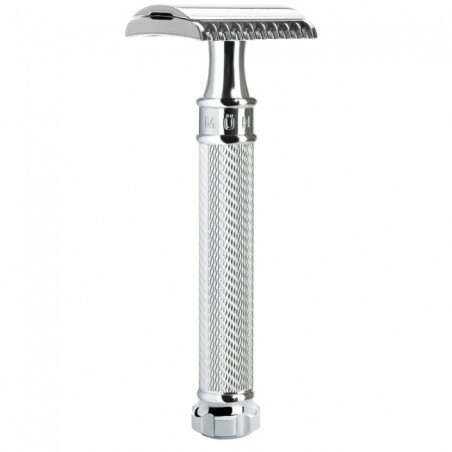 The new MÜHLE safety razor with precision mechanics and highly functional design. The cap of the razor can be released with a simple twist of the small wheel at the end of the handle. The open comb remains firmly attached to the handle. Used blades can then be removed safely and replaced with new ones. The R41 TWIST will be favoured by all wet shavers who prefer the slightly heavier model and a more gently attuned safety razor. This design combines high-quality metal-working (chrome-plating) with an extremely fine engraved finish. Comes with a short instruction and one blade. This model also fits the stands RHM SR and RHM SR SET. Perfecta para barba muy dura. En combinación con hojas Feather dá un apurado extremo con solo una pasada. Muy contento con la compra.